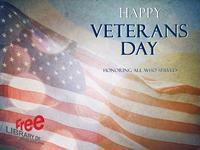 Veterans Day originated as "Armistice Day" on November 11, 1919, the first anniversary of the end of World War I. Congress passed a resolution in 1926 for an annual observance, and November 11 became a national holiday beginning in 1938. Unlike Memorial Day, Veterans Day pays tribute to all American veterans—living or dead—but especially gives thanks to living veterans who served their country honorably during war or peacetime. In 1919, the 369th infantry regiment marched home triumphantly from World War I. They had spent more time in combat than any other American unit, never losing a foot of ground to the enemy, or a man to capture, and winning countless decorations. Though they returned as heroes, this African American unit faced tremendous discrimination, even from their own government. The Harlem Hellfighters, as the Germans called them, fought courageously on–and off–the battlefield to make Europe, and America, safe for democracy. Their story is documented in this cinematic-styled graphic novel. Ever since his brother, T.J., was killed in Iraq, Matt feels like he's been sleepwalking through life—failing classes, getting into fights, and avoiding his dad's lectures about following in his brother's footsteps. T.J.'s gone, but Matt can't shake the feeling that if only he could get his hands on his brother's stuff from Iraq, he'd be able to make sense of his death. But as Matt searches for answers about T.J.'s death, he faces a shocking revelation about T.J.'s life that suggests he may not have known T.J. as well as he thought. What he learns challenges him to stand up to his father, honor his brother's memory, and take charge of his own life. With compassion, humor, and a compelling narrative voice, E. M. Kokie explores grief, social mores, and self-discovery in this provocative novel. Liz served in Iraq with her trusty military working dog, Ender, by her side. But now that her tour is over, she has to readjust to life in her small New Hampshire town. Despite being surrounded by people she's known her whole life, Liz feels entirely alone and soon gets trapped in a downward spiral of flashbacks and blackout drinking. Things seem destined for a bad end, but when Liz's on–again–off–again boyfriend, Ben, almost hits a stray dog while she is in the car, things start to change. Brutus might just be the only thing that can bring her back from the brink. A searing and honest portrait of reentry to civilian life after war and a touching exploration of the bond between dog and human. Thank you to our veterans—not only on veterans Day, but every day—for their service and sacrifice.